Named for their candy-sweet flavor, Hawaiian Candy Apple Bananas are smaller than the more common Cavendish variety. 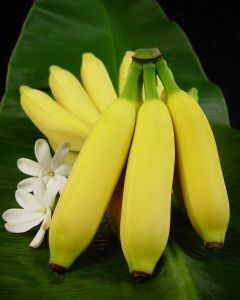 These delicious bananas are firm, but moist, and the flesh has a slightly pinkish tone which deepens with cooking or baking. Delicious Hawaiian Candy Apple Bananas delivered to your door every month! Join our Monthly Apple Banana club and you won’t have to go without for long. We’ll ship a box out to you on our monthly schedule (and you save $5!). Please note: this subscription must be purchased separately from our other products. What is a Hawaiian Candy Apple Banana? 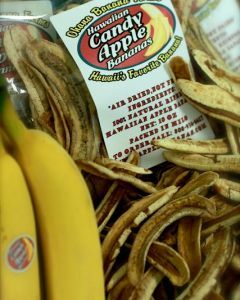 A Candy Apple Banana is a nutritious, tasty and sweet banana grown right here on the lovely Big Island of Hawaii. It is low in calories, high in potassium, a good source of Vitamin B6 and fiber. Candy Apple Bananas are naturally sweet with sucrose, fructose and glucose and have 3 times more Vitamin C and 1-1/2 times more Vitamin A than your regular banana varieties.